Dr. Greg J. Dixon condensed from: This Day in Baptist History III (David L. Cummins), pp.180-181. The post 87 – March 28 – THIS DAY IN BAPTIST HISTORY PAST appeared first on The Trumpet Online. 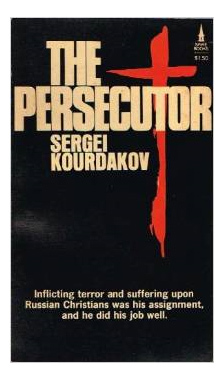 Some time ago, when preparing a sermon on the life of the apostle Paul, I came across the story of Sergei Kourdakov. Today’s post is adapted from the illustration I used as the introduction to that sermon. A lot happened that year. It was the year Neil Armstrong walked on the moon. It was the year my parents got married. And it was the year that John MacArthur became the teaching pastor of Grace Community Church. It was in that same year that 18-year-old Sergei Kourdakov, a Russian orphan who had distinguished himself as a leader in the Communist Youth League, began his term at the Soviet naval academy. Given his natural leadership ability and his commitment to the Communist cause, it was not surprising that Kourdakov was soon approached by the KGB, who put him in charge of a secret branch of the city’s police force. As a secret KGB unit, Kourdakov’s squad of fellow soldiers was largely tasked with targeting church meetings and the Christians who attended them. These “believers” posed a threat to the state and to communism itself, or so Kourdakov was told. As such, they had to be found and stopped by whatever means were deemed necessary. Over the next two years, Kourdakov would carry out more than 150 raids on Russian underground churches and Christian communities. On one such occasion, he and his men hid while an outdoor baptism service was being conducted. As soon as the baptisms were over, his men attacked. The Christians, of course, did not fight back. But that didn’t stop Kourdakov’s unit from treating them with brutality. Within minutes, all of the believers were beaten and bleeding, lying on the ground. The pastor himself was dead, his body floating in the river where he had just performed the baptisms. As the attacks continued, Kourdakov was shocked to notice that many of these believers were young people – even as young as he was. He was also startled by the fact his raids were not effective in stopping Christian meetings. To his surprise, people who were beaten and arrested at one meeting would later be found attending subsequent meetings. It seemed that the more he persecuted the church the more the church grew. In each of these raids, in addition to beating and arresting the believers, Kourdakov and his men would confiscate any Bibles or other religious literature they found. These would either be destroyed or sent back to KGB headquarters. One day, Kourdakov himself was curious about what these Christians were reading. So he picked up one a few pages of Christian literature and snuck them back to his room at the naval academy. He was now conflicted. Soon he began to realize that the communism to which he had dedicated his life was nothing more than an empty façade. With the words of Christ piercing his soul, Kourdakov knew he had to get out of the KGB, and if possible, the Soviet Union. Soon he had his opportunity. After graduating from the Soviet Naval Academy, he was stationed on a cruise ship patrolling waters off the western coast of North America. He thought that if his ship came close enough to land, he might be able to jump overboard and swim for shore. On September 3, 1971, Kourdakov jumped off of his ship into the cold waters of the Pacific Ocean. The next morning he washed up on the coast of British Columbia. Amazingly, he was alive. While still on the Soviet ship, Kourdakov had purposed in his heart that once he escaped he would serve the very Jesus he had persecuted so vigorously. True to that promise, he began attending an English-speaking church in Toronto, Canada. He also visited a Ukrainian church where he was given a Russian Bible. Kourdakov immediately recognized the Russian Bible as being the same type of Bible that he had often confiscated from the believers in Russia. He asked where it came from, and was told that it was distributed by a missions organization known as Underground Evangelism—a California-based ministry that helped to smuggle Bibles into communist countries. Soon after, Kourdakov himself moved to California where he worked with Underground Evangelism. Incredibly, the man who had persecuted Christians, who had been involved in the beatings and even murders of believers, was now helping a missions organization do the very thing he had once violently opposed! God had graciously brought Sergei Kourdakov to faith in Christ. Just a few months later, the Lord would take him home. On January 1, 1973, Kourdakov was found shot dead in his room. Based on threats he received before he died, he was almost certainly assassinated by KGB agents who wanted to silence him. Kourdakov’s testimony is pretty remarkable: A man who violently persecuted the church for a cause he thought was right, only to find that the cause he had so passionately pursued was false and he had actually been fighting against the truth. Confronted with the words of Christ, his heart was dramatically changed. He left his former life behind, and joined the very movement he had been persecuting, promoting the work of Underground Evangelism so that more Bibles could be sent back into the Soviet Union. In the end, he was killed by the agency he had formerly served. In many ways, the story of Sergei Kourdakov parallels the story of the man whose life we will be looking at in our message today. That person, as you might have guessed, is the apostle Paul. Balthasar Hubmaier received the doctorate of theology from the University of Ingolstadt in Germany and entered the Roman Catholic ministry on Sept. 29, 1512. Through his studies he became disillusioned with what he had been taught and by 1523 was in contact with the Protestant reformer, Zwingli and he was transformed by the grace of God. Later he left Zwingli over believer’s immersion. His outspoken ways brought great persecution down upon him. He like Peter, under pressure, denied the truth, but repented and was able to give a glorious testimony to God’s grace in the flames of martyrdom on March 10, 1528. Three days later his wife Elizabeth, undaunted in her faith, was thrown into the Danube River and drowned. The doctrine that caused our Anabaptist forebears to suffer at the hands of Catholic and Protestant Reformers alike was infant baptism. That wicked heresy was established in the third century as Cyprian consulted with sixty bishops upon the question of whether children were to be baptized on the third or eighth day from their birth? Our forefathers the Donatists, repudiated this falsity. The Reformers, Luther, Zwingli, and Calvin continued in this heresy, and also persecuted the Baptists, and other non-conformists over this issue, which they had received from Augustine. [Wm. R. Estep, The Anabaptist Story Nashville: Broadman Press, 1963), p. 49. Dr. Greg J. Dixon: From: This Day in Baptist History II: Cummins and Thompson, pp. 533 – 34. The post 272 – Sept. 29 – This Day in Baptist History Past appeared first on The Trumpet Online. Dr. Greg J. Dixon: From: This Day in Baptist History Vol. I: Cummins/Thompson, pp. 303-04. The post 206 – July 24 – THIS DAY IN BAPTIST HISTORY PAST appeared first on The Trumpet Online. The post 126– May 05 – This Day in Baptist History Past appeared first on The Trumpet Online.